To diversify your investment portfolio, investor should consider to have several bond mutual funds. 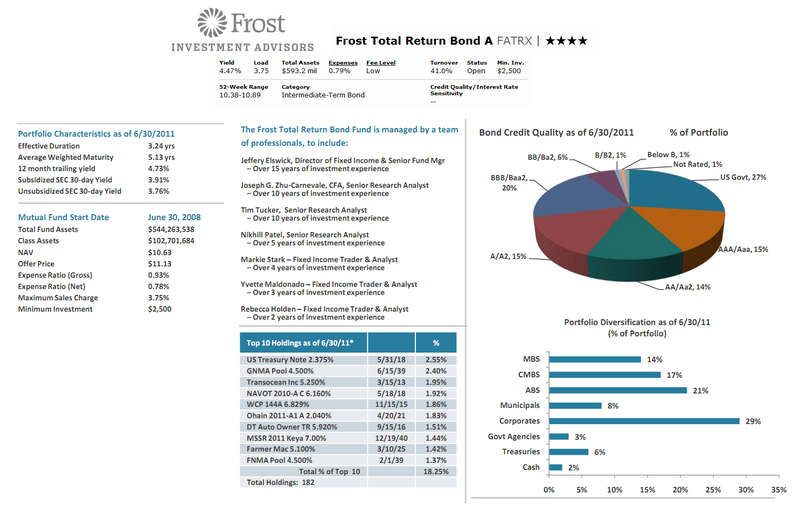 One of the best rated taxable bond funds is Frost Total Return Bond fund. This fund is rather new but is has provided consistent return. The following article will provide the fund's review. The Frost Total Return Bond fund seeks to maximize total return (i.e. provide income and capital appreciation), consistent with the preservation of principal. The fund usually invests majority of net assets (>80%) in investment grade fixed income securities. The fund typically has the average weighted duration of plus or minus 3 years of the fund benchmark's duration. This Frost fund may invest in below investment grade bonds. The minimum balance to invest in this best mutual fund is $2,500 for brokerage account and $1,500 for retirement (IRA) account. This fund requires $500 for the minimum subsequent investment. This fund can be purchased from a limited list of 22 brokerages, such as JP Morgan, Scottrade Load, Schwab Retail, ETrade No Load Fee, Fidelity Retail Funds Network, Pershing Fund Center, etc. The other class of this fund is the Institutional Class (Ticker: FIJEX). This FATRX fund has returned 4.37% over the past one year and 8.16% over the past three years. This fund has been rated with 4-stars Morningstar Return Rating. For the previous two years after its inception, this top rated bond fund has given positive return (19.12% in year 2009 and 8.57% in year 2010). It has 4.06% YTD return. Currently, the three-year beta of this fund is 0.58%. The top 10 bond holdings in this fixed income fund as of June 2011 are US Treasury Note (2.55%), GNMA Pool (2.40%), Transocean Inc (1.95%), NAVOT (1.92%), WCP (1.86%), Ohain (1.83%), DT Auto Owner TR (1.51%), MSSR 2011 Keya (1.44%), Farmer Mac (1.42%) and FNMA Pool (1.37%). These are the top holdings out of 182 total holdings that represent 18.25% of total portfolio. As of June 2011, the top bond credit quality based on the portfolio percentage is US Government (27%), BBB (20%), AAA (15%) and A/A2 (15%).